The markets may have recovered from the disastrous last quarter of 2018, but that doesn’t mean all the trouble is behind us. There is plenty of risk to take into account in the coming weeks. In other words, investors should remain cautious. The Fed decided not to raise rates in January and plans on being patient. That’s good news for the markets – but why is the central bank concerned enough to not be in a hurry to raise rates? At least part of it is due to the ongoing trade war with China and mixed earnings results. There could be economic slowdown risk on the radar. Of course, potential future risk is not a reason in itself to avoid the market. In fact, if you spent all your time worried about possible risk, you’ll never get a chance to invest. Sitting on the sidelines is a guaranteed method of not participating in the market’s upside. The easiest solution to how to invest in a risky environment is to hedge your portfolio. There are an infinite number of ways to hedge, so let’s just look at one… buying gold. While I personally don’t love gold as an investment, it is certainly considered by many investors to be a safe-haven vehicle in times of economic risk. What I don’t like about owning gold (the physical commodity, not gold miners) is the lack of cash flow. Commodities don’t generate cash, so they can’t pay dividends or do share buybacks. In addition, they can’t grow in the traditional sense. Fortunately, options provide an easy answer to this dilemma through the use of covered calls. 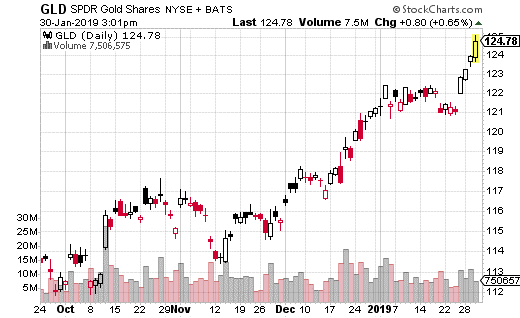 For example, I just came across a large covered call trade in SPDR Gold Shares ETF (NYSE: GLD). GLD invests in physical bullion so it’s the closest you can get to buying physical gold without actually having to find a place to store the metal. A covered call trader purchased 400,000 shares of GLD at $123.97 while selling 4,000 March 15th 125 calls for $1.40. What that means is the trader collects $560,000 ($140 x 4,000) of premium which is kept no matter what. That means the long GLD shares are protected down to $122.57. What’s more, this trade allows the covered call holder to earn appreciation on GLD shares up to $125. After that, the gains are capped. So, the call premium ($1.40) is generating a 1.1% yield. Plus, the trade can earn another 0.8% in GLD upside. Now, 1.1% yield may not seem like a whole lot, but consider a couple factors. The yield is being paid for just 45 days, so annualized that’s 9%. A 9% annual yield to hold a asset that is supposed to be a safe-haven investment is not bad at all. Keep in mind, the GLD owner is likely happy just to see gold hold its value if the market tanks. They don’t necessarily care all that much about the upside. So, you are essentially getting paid 9% annually to protect your wealth. If you are fan of using gold as a hedge, using a covered call like this is a great way to do so and get paid along the way.